There’s never been any doubt that Jordan Peele is a talented entertainer. Back when he first broke out into popularity on Mad TV and Key & Peele, though, nobody could’ve predicted that he’d go on to become an Academy Award-winning writer. Even more surprising, he took home the Best Original Screenplay Oscar for a horror picture. Get Out was a mind-blowing directorial debut, mixing brilliant satire with genuinely horrifying real-world commentary. That being said, it was only Peele’s first movie, meaning he could either evolve into this generation’s Alfred Hitchcock or the next M. Night Shyamalan depending on what he did next. 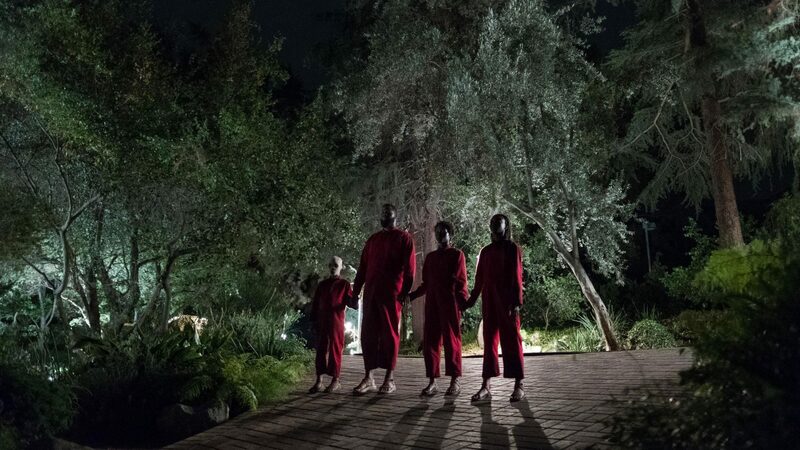 With his follow-up movie, Us, Peele further proves that he’s the real deal, cementing his place one of modern filmmaking’s finest. In Us, Lupita Nyong’o delivers a beguiling performance on par with her Best Supporting Actress winning work in 12 Years a Slave. Nyong’o plays Adelaide Wilson, a woman traumatized by an encounter she had with a lookalike in a house of mirrors as a child. Along with her husband Gabe (Winston Duke), daughter Zora (Shahadi Wright Joseph), and son Jason (Evan Alex), Adelaide heads to her family’s vacation house by the beach. All seems well as they kick back with their friends Kitty (Elisabeth Moss) and Josh (Tim Heidecker), but Adelaide senses something is amiss. Her worst fears are realized when four strangers arrive at the house one night, looking exactly like the Wilson family. Usually whenever one actor plays a set of doppelgängers, it’s fairly obvious. Nyong’o is so transcendent in her dual performance, though, that you’d swear it’s her long-lost twin sister playing Adelaide’s sinister counterpart. Going by the name Red, Adelaide’s double speaks as if the life has been half-choked out of her, leaving the audience clenching in dread with every word she utters. Red reveals that she’s been living in Adelaide’s shadow and is ready to rise up as her own individual. Wielding what might be the sharpest pair of scissors in cinematic history, Adelaide and her family plan to untether themselves from their privileged lookalikes. As terrifying as the setup is, Us soon snowballs into something even more ambitious and larger in scale. Us is like a home invasion movie crossed with an alien invasion movie. It has the grounded thrills you’d find in The Strangers, but also an otherworldly sense of terror that calls Invasion of the Body Snatchers to mind. The film’s self-aware humor and underlying themes regarding class conflict are even reminiscent of Wes Craven’s The People Under the Stairs. Above all else, Us is a modern day journey into the Twilight Zone, echoing classic episodes like Mirror Image, In Praise of Pip, and especially The Masks. Actually, if Peele’s upcoming Twilight Zone reboot is nearly as thought-provoking as this film, the late Rod Serling may finally have a worthy successor. While it shares parallels with various films and shows, Us is a wholly unique experience, arguably even surpassing Get Out. With his sophomore outing, Peele has made an even more visually stimulating film. He meticulously paints his picture with clever motifs and haunting imagery, making the sheer presence of the color red send chills down the viewer’s spine. This isn’t just a film that crawls under your skin, but one that lays eggs under your skin, planting seeds of paranoia that slowly engulf your entire body. Hitchcock might’ve made birds and showers scary, but Peele does something perhaps even more impressive, making the audience afraid of their own reflection. This entry was posted in Reviews and tagged Horror, Thriller on March 21, 2019 by Nick Spake.